Excellence in Qur'anic recitation, Islamic Morals and Character Building. ​Nurturing and instilling good qualities and beautiful characteristics in our students, through the teachings of the Prophet Muhammad ﷺ. We understand that children are our future. Our qualified teachers and dedicated staff are committed to providing excellent Islamic education. To supplement the teaching, we intend to offer extra-curricular activities at the centre, such as karate classes, scouts, trips to parks, etc. Dhikr and nasheed practice will also be part of the learning experience at MQA. 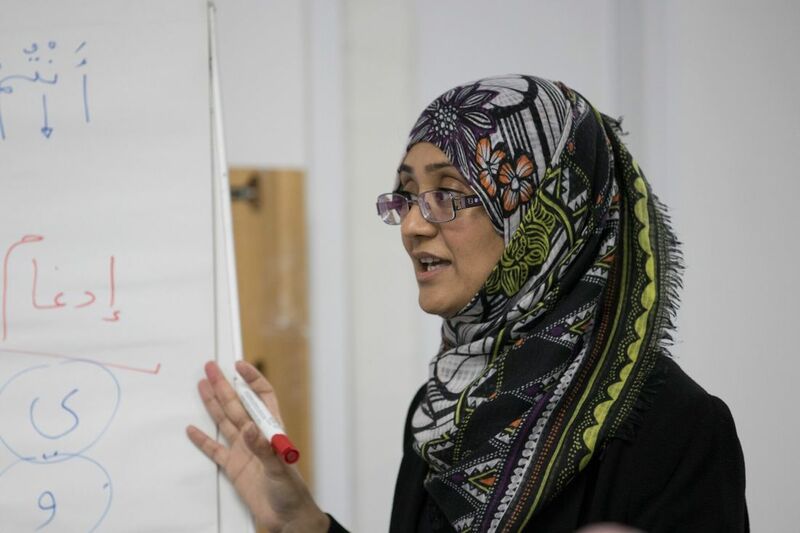 ​At Manchester Qur’an Academy, we have developed a syllabus that will provide our students with everything a young Muslim needs to know about their faith. A well rounded purposeful education taught within a positive spiritual environment, inspiring and engaging children of mixed abilities to become beacons of light within their own homes and our community. Faith is inseparable from good character and excellent moral conduct. How well we treat our fellow humans, and how we interact with the world around us in general, are all important aspect of being a good Muslim. At Manchester Qur’an Academy we aspire to nurture the purity and innocence of our children by providing them with the opportunity to learn and reflect upon their role in and of this world, as well as supporting and enabling their spiritual growth. We believe the key to moral and spiritual excellence lies in instilling love and consciousness of Allah and a stronger attachment and love of our Prophet Muhammad ﷺ..
Every child is born pure and innocent, but as the saying goes, it takes a village to raise a child. Let us together lay the foundation that will encourage and strengthen our children. Manchester Quran Academy is based at the Waterloo Centre, Cheetam Hill, Manchester. The Waterloo Centre in Cheetham Hill was acquired by Guidance Hub in September 2017 and is now the headquarters for all its activities. It boasts a large multipurpose hall, offices, classrooms, a SEN room, and amenities. ​389 Waterloo Road, M8 9AB. The centre is easily accessible from the motorway, and situated just off Cheetam Hill Road. If you are travelling via public transport you will be able to catch the 135 bus from Manchester City Centre. The closest tram stop is at Abraham Moss. Due to the safety of your children and vehicles, no form of transport (for centre users) will be permitted onsite during hours of 4:15 pm - 6:15 pm. We advise parents to walk their children to the centre where possible, and to car-share if they are travelling from afar. Please do not park near the entrance to the centre & be considerate of other road users. Q) What is MQA’s main focus? A) Excellence in reading the Majestic Quran. A) At MQA we believe that children are our future. Every child has a strength and the teachers will work accordingly with each student. Children will be placed in classes according to their ability and not age. They will be interviewed by the principal of MQA Shaykha Noshin Gul to determine their place. Q) What age do children have to be to enrol at MQA? A) We accept children aged 6/7 as newcomers (for older students please ask to see the principal). Students stay with us until they finish a complete recitation of The Noble Quran and up to a maximum of 13 years of age. Classes from ages 10+ are either segregated or completely separate. Q) What subjects will be taught? A) Recitation of The Glorious Quran with tajweed and the basics of deen including duas, the five pillars of Islam, cleanliness, prayer, good manners and related topics. Q) What syllabus will be taught? A) We use the IQRA series for learning the Arabic alphabet and pronunciation. The Qamar Academy syllabus will be used for Islamic studies and the teachers may provide supplementary materials. Q) Will the students be given homework? A) We do not want to burden children will much homework. However, they will be required to review at home what they learn at the academy. Q) Are the teachers CRB/DBS checked? A) Yes, all individuals working at the academy are DBS checked. ​Q) What madhab does MQA follow? Q) How will the students be assessed? A) The students will be given written and oral tests. Q) How and who do I get in touch with in case of any concerns, queries or complaints? A) We have an admin person who is the first point of contact for any concerns or questions. These will then be passed on to the relevant individuals. Alternatively email us on MQA@guidancehub.org or call 0161 870 6001. Q) What is the fee? How will the payments be made? Are there any sibling discounts? A) There is an initial registration fee of £25. The MQA yearly fee is to be paid as 12 monthly instalments of £50 each. Payment of the registration fee can be made using contactless or card payment only. The monthly instalment must be paid via Direct Debit (using GoCardless). Q) Do the students have to wear a uniform? A) Yes, boys will be required to wear white robes, with green jumpers and hat and girls will wear black abayas, with green cardigans and black scarves. We have our own branded Jumpers & cardigans available for purchase. Q) What time does the academy operate? A) The academy will operate Monday to Thursday from 4:20pm to 6:10pm. Q) Will the academy operate during school holidays? A) Our term times will correspond to school term times, including holidays. Q) Are parents allowed to visit the academy? A) Parents are not allowed to visit or stay while the classes are being held. If you have any concerns, enquiries or would like to speak to someone, the admin and principal should be approached first. Q) What will be the class size? A) Each class will have a maximum of 15 students along with one teacher and a teaching assistant.